New York Strip Steak with Garlic Parsley Butter is fantastic! This easy steak recipe calls for grilling steaks first. Then you slather the steaks with plenty of garlic parsley butter before serving. That really brings out the flavors of the steak magnificently. It’s so easy, you hardly need a recipe. All you do is salt and pepper your steaks. 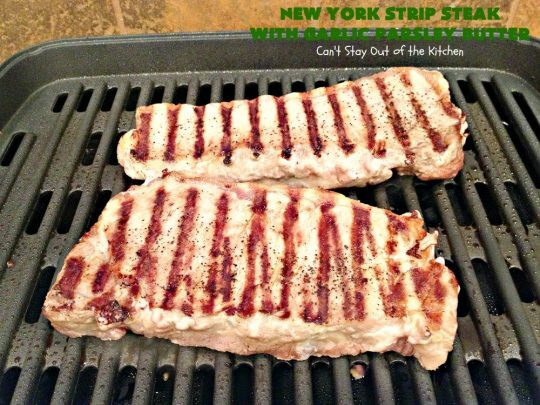 Grill them over a gas or indoor grill to your desired doneness. Then spread a thick coat of the garlic parsley butter over top and bottom of the steaks before serving. Wow. This steak was incredibly good. The biggest thing you have to be concerned about is getting your steaks to everyone’s desired doneness. Remember that smaller steaks take less time. Some people want their steaks well done and others medium rare. I’ve been trying to clean out my freezers of a lot of meat and came across a couple of New York Strip Steaks. I hunted online for a good sounding steak recipe. I came up with this great tasting recipe. albeit with a few modifications. 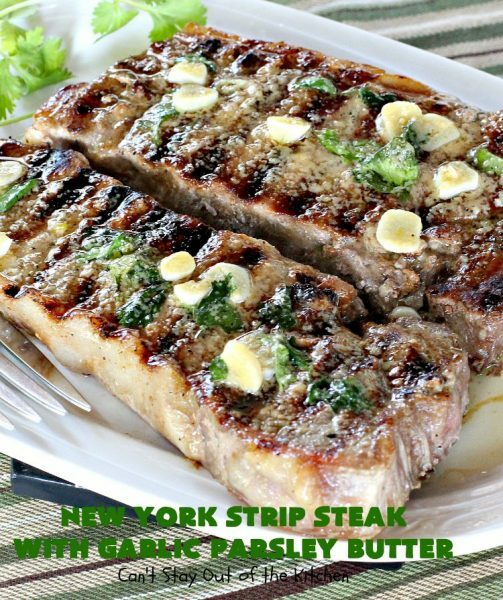 New York Strip Steak with Garlic Parsley Butter is overall a very healthy, gluten free, and tasty recipe, that is just a great way to prepare steaks. Obviously, you can add other spices and herbs if you desire. I added parsley because we love parsley in just about everything! Every now and then we pick up steaks and other meats at rock-bottom prices when they are closing them out at Kroger. We stash them in the freezer for later. These steaks were one of those finds. The sauce will actually be enough for four steaks although we only used two for this recipe. If you’re looking for a great way to serve steaks after grilling them, this is it! This recipe adds a nice little taste of garlic and parsley, so it’s really mouthwatering. Consider making this incredibly easy New York Strip Steak with Garlic Parsley Butter the next time you want to grill out. While a gas grill is great for grilling steaks, ours was on the fritz. So I grilled these steaks on our indoor DeLonghi grill which I like a lot better than our Foreman grill. 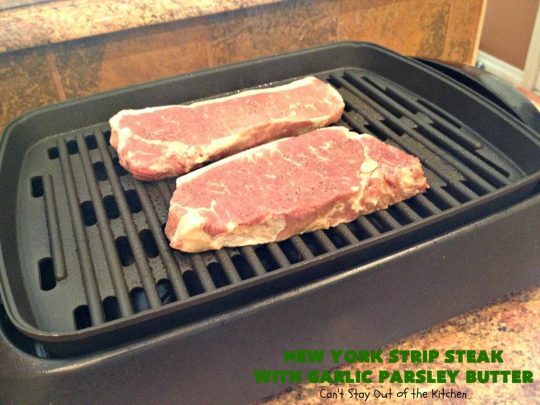 No matter what kind of grill you use to cook these steaks, you won’t be disappointed. Just make sure you don’t overcook or undercook your meat! New York Strip Steak with Garlic Parsley Butter is an awesome recipe! These steaks were so succulent. My mouth watered as I prepared to eat one of these tasty cuts of beef. 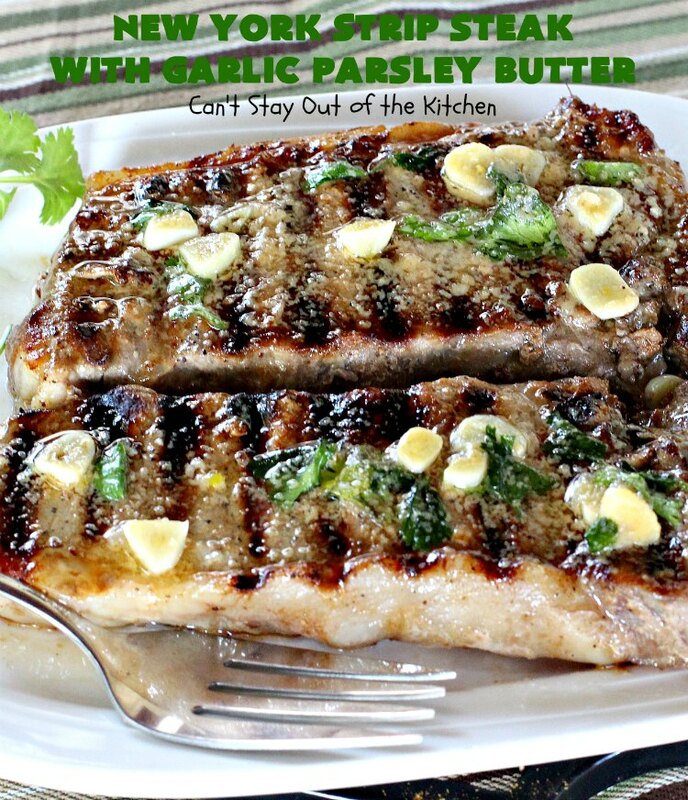 The butter glaze is made with garlic powder, fresh garlic slices and fresh parsley. It adds tremendous depth to the recipe. I served this steak with Spicy Sweet Potato Oven Wedges which were fantastic also! The garlic parsley butter is so easy to make up and grilling steaks is probably the easiest way to prepare them too, so this is a win-win situation–it’s E-A-S-Y!!! 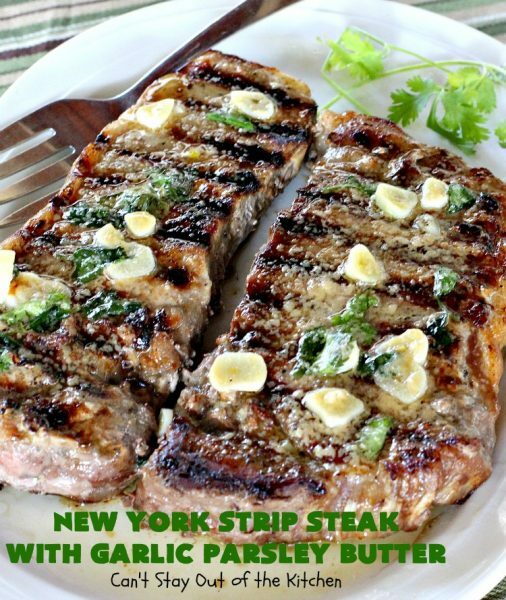 New York Strip Steak with Garlic Parsley Butter is a great entree to prepare during the hot summers so you can keep the heat out of your house! My husband and I both enjoyed these steaks, and I loved the fact that they didn’t take long to cook or prepare. Melt butter in a small saucepan. Add garlic powder and sliced or minced garlic and saute for a few minutes until garlic has softened a little. Add parsley and stir to combine. Remove from heat and set butter aside until you’re ready to serve. Place on a hot grill and cook until desired doneness. For most gas grills that will be about 5-10 minutes per side depending on how close the steaks are to the meat. I used my indoor Delonghi grill and it took about 10-12 minutes per side. This also depends on the thickness of the steak. Turn the steaks over and cook the other side. To test for doneness, use a knife. Check for the amount of pinkness you want the steak to have. The larger steak took longer to cook than the other one in the picture. 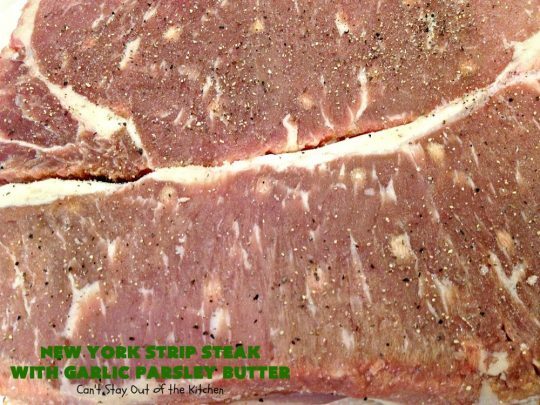 To serve: Brush both sides of steaks with garlic parsley butter and serve on a platter. The Garlic Parsley Butter for these New York Strip Steaks provided such a sumptuous flavor. 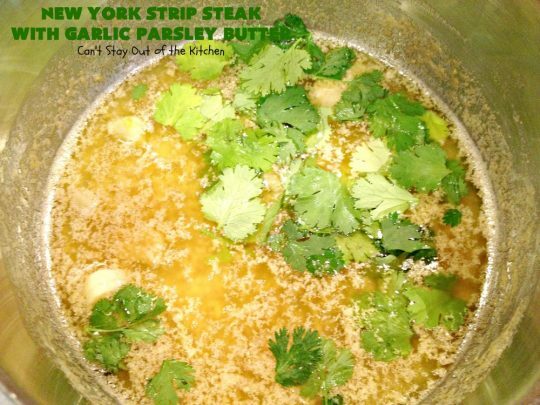 I love both garlic and parsley and use it all the time. It really worked well for this recipe. The granulated garlic powder cooked up in the sauce and that’s what those tiny pieces on top of the steak are. You need to grill the steaks according to your desired preference. 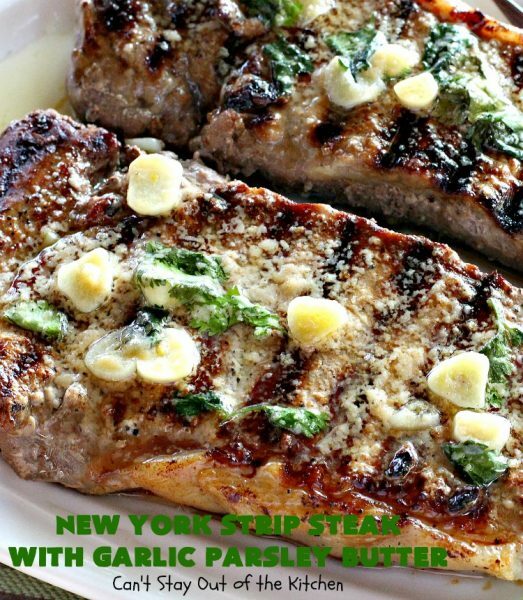 You can also serve the steaks on your plate and ladle the Garlic Parsley Butter over top. 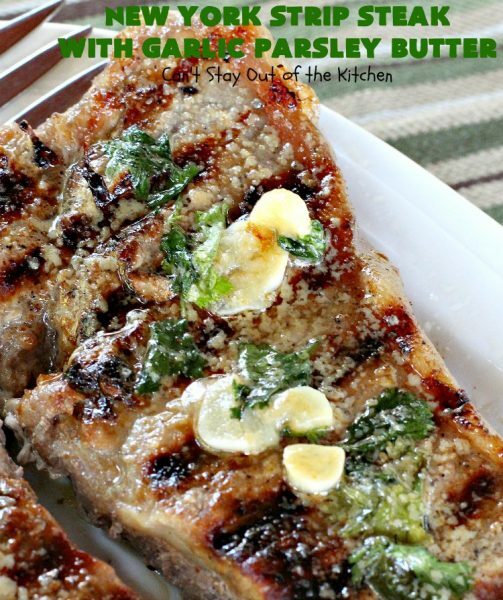 Succulent and delicious steak with a garlic-parsley butter sauce poured over top for serving. 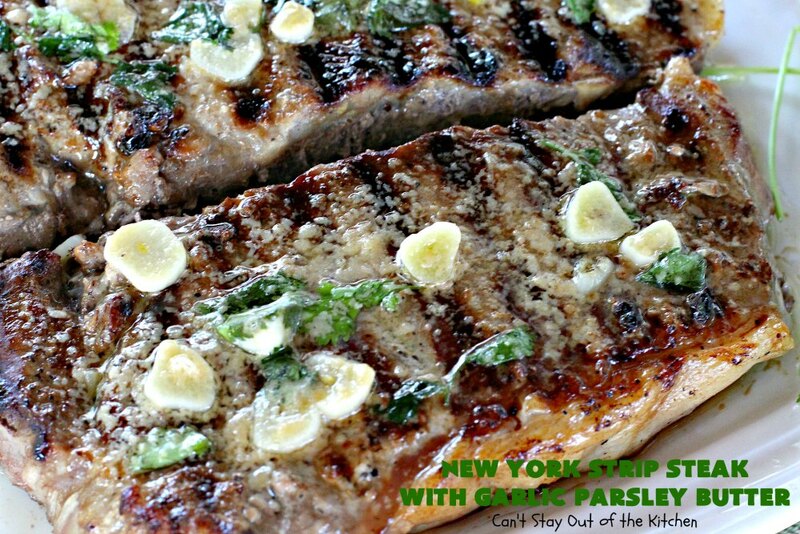 This is an easy & tasty recipe for grilling out with friends. It's also terrific for holiday menus like Mother's Day or Father's Day. Melt butter in small saucepan over medium heat with garlic cloves and garlic powder. Cook until garlic is softened—a few minutes or so. Salt and pepper steaks, to taste. Spray grill with olive oil cooking spray. Place steaks on grill and grill over high heat and cook about 4-5 minutes per side or according to desired doneness. 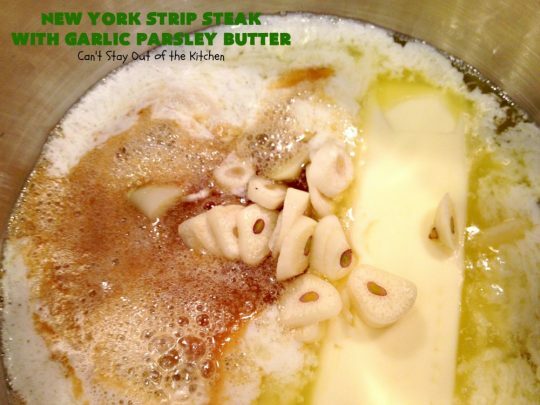 Remove from heat and brush generously with garlic-parsley-butter mixture. NOTE: I used an indoor grill which took about 10-12 minutes per side. Succulent and delicious steak with a garlic-parsley butter sauce poured over top for serving. I used an indoor grill which took about 10-12 minutes per side. 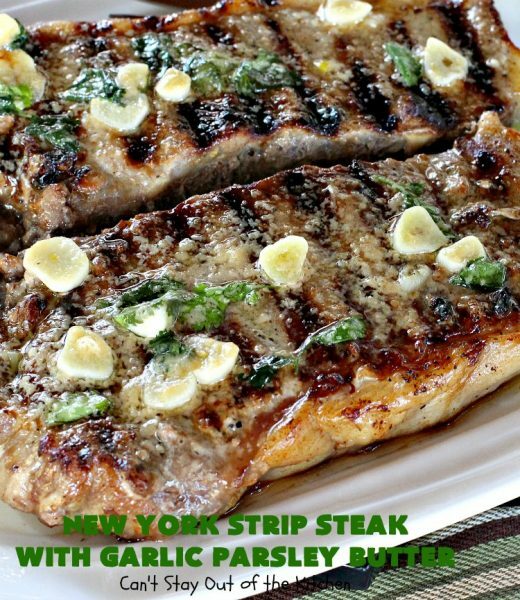 New York Strip Steak with Garlic Parsley Butter was a quick and easy main dish entree. You can serve this with any vegetable and a side salad. Roasted vegetables on the grill or veggie kabobs are also great options if you’re trying to keep these cool for summer! I served our steaks with amazing Spicy Sweet Potato Oven Wedges. Here’s another close up where you can see the granulated garlic powder along with the sliced garlic and parsley. There was enough sauce for four steaks although I only grilled up two steaks. Ah, yes! 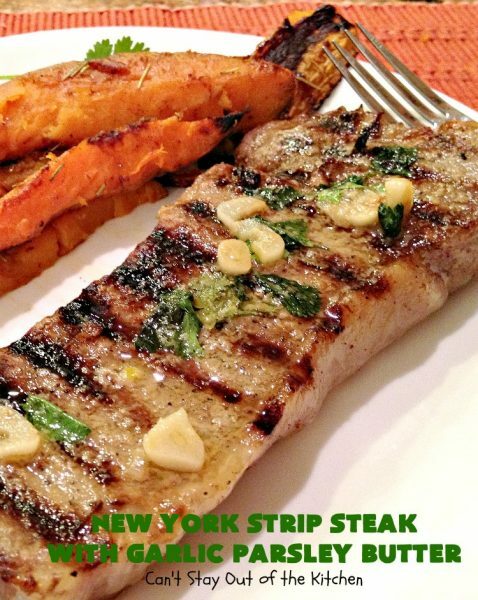 Are you ready for a bite of this delicious steak? It really was great! Give it a try sometime. I bet it would be just as good with pork chops and probably even chicken or fish!